StreamJar has a live, drag-and-drop overlay editor that allows you to design your overlay by simply dragging different elements onto your broadcasting scene, with minimal setup. We support a range of customization options, and allow you to upload custom images and sounds to make your stream as unique as possible. Our editor is flexible, and changes appear on your stream instantly. We can pull alerts and other data from Mixer, Twitch, Smashcast, Twitter, Spotify, Tiltify, Extra Life, and, of course, you can use more than one platform at the same time. Your viewers can tip you directly through PayPal, and we'll use your overlay and chat bot to fire alerts. Setup couldn't be easier; simply entering your email address is enough to set you up with a tip page. With our drag-and-drop tip page editor, you can also configure some cool extra perks for your donators, like custom inputs, song requests, Minecraft whitelists, and audio recordings. StreamJar takes absolutely no fee or cut of your tip. StreamJar provides a cloud-based chat bot providing an array of in-chat functionality. Hosted by us so it works even while you're offline! 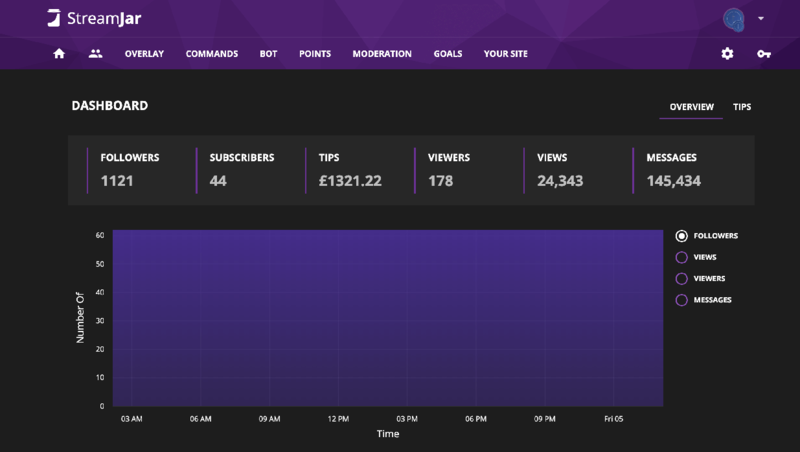 With StreamJar you can keep your chat clean and tidy with our extensive moderation functionality, you can provide your own in-chat currency with our points system, and much more.